Whether you’re among the 1 in 3 Americans with high blood pressure or have so far avoided this deadly disease, these tips will help prevent becoming a statistic. Heart disease and stroke rank among the top five causes of death in the U.S. They’re also both commonly caused by one condition: hypertension. One in three Americans suffer from this often symptom-less condition, also known as high blood pressure and the silent killer. The ideal blood pressure reading is generally 120/80, with higher readings considered pre-hypertension or, if over 140/90, hypertension. 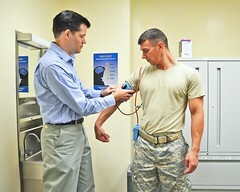 If you don’t know what your blood pressure is, step one is finding out by checking with your doctor. In the long run, that visit will cost less than letting the problem remain undiagnosed – and uncontrolled. Even if you require medication, it’s cheaper than the long-term costs and complications of untreated high blood pressure. Pass the salt. Limiting sodium helps control high blood pressure in those who have it and helps prevent it in those who don’t. According to government dietary guidelines, adults should limit their daily sodium intake to 2,300 mg. But for people with hypertension, diabetes, or chronic liver disease; children; adults over age 50; and African-Americans – about half the U.S. – the limit is 1,500 mg. Beware especially of processed and packaged foods, fast foods, and canned foods – all common sources of excessive salt. Eat enough potassium. This mineral helps lower blood pressure. The recommended daily intake for adults is 4,700 mg. Bananas average 451 mg – foods with even more include cantaloupe, avocados, dates, raisins, dried apricots, prune juice, baked potatoes (with the skins), yogurt, sardines, and flounder. Check out the University of Massachusetts Medical School’s downloadable list of Sources of Dietary Potassium for more. Change your diet. The DASH diet, or Dietary Approaches to Stop Hypertension, helps fight high blood pressure by emphasizing fruits and vegetables, whole grains, and lean sources of protein. U.S. News & World Report also recently ranked it the No. 1 best diet overall, No. 1 best diet for healthy eating, and even the No. 1 best diabetes diet. Check out Dr. Oz’s recent segment about the diet to learn more. Watch your weight. Blood pressure tends to increase as weight does. Last year, a University of Illinois study found that even among hearty college students, a weight gain of as little as 1.5 pounds was enough to raise BP. Fortunately, it’s also true that BP tends to drop as weight does. Relax. The connection between stress and high blood pressure isn’t fully understood. But researchers do know that (1) stressful situations can cause temporary BP spikes and (2) stress management and stress-lowering activities can help lower BP, according to the Mayo Clinic. Getting enough sleep, deep breathing, meditation, yoga, and exercise can help reduce stress. Check out 7 Cheap Ways to Relieve Stress for more ideas. Avoid alcohol. According to the Mayo Clinic, not only does too much alcohol raise blood pressure, repeated excess drinking can lead to long-term BP increases. Women should limit themselves to one drink, men to two. Indulge in dark chocolate instead. An Australian study published last year found that a daily dose of dark chocolate or other cocoa products rich in natural compounds called “flavanols” helped to lower blood pressure. Just don’t overdo it and gain weight. This entry was posted in Heart Attack, Heart Disease and tagged African American, alcohol, blood pressure, chocolate, DASH Diet, Diet, hypertension, Mayo Clinic, medication, National Institutes of Health, potassium, salt, sodium, stress, U.S. News & World Report, weight. Bookmark the permalink.